OCEAN OUT FRONT & RIVER OUT BACK! Sunrise on the ocean, sunset on the river, a bit of Olde Florida in between! From spectacular ocean sunrises to river sunset vistas and endless stars at night, here's your ticket to the best camping vacation ever! Very nice sites, all are large and separated by trees and shrubs. Great access to beach and intercoastal. Good fishing on the dock. Restaurant onsite has great food and is reasonably priced. Bait available on dock. The office staff were very pleasant and helpful! We liked this park and will plan to come back. 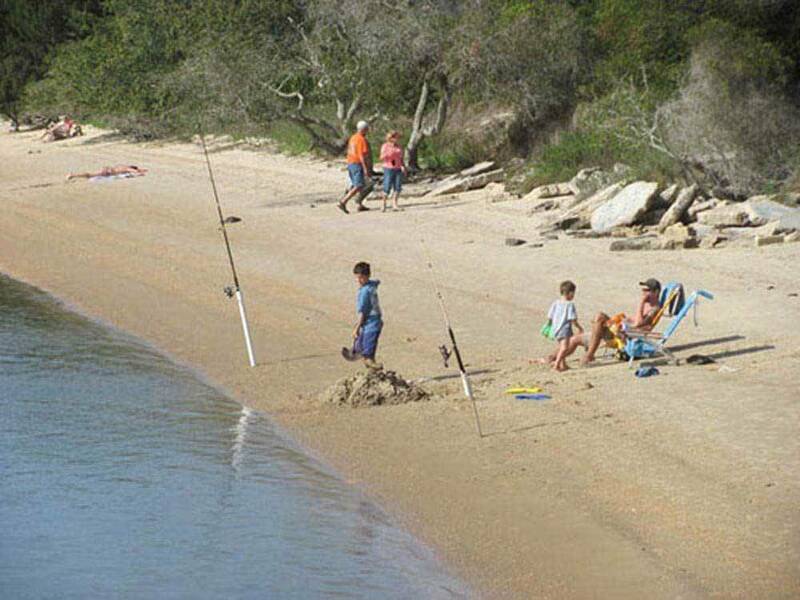 The beach is located right across the street and the back of the campground is on a river. The check in was quick and easy and everyone in the office was friendly. The sites are roomy with some vegetation between each site which allows for some privacy. The roads and sites are dirt and we had partial shade. The restrooms and showers were nice & clean. On the river, there is a pier for fishing. The sunsets over the river are beautiful. That’s the place to be when the sun is setting. There is a Publix just down the road for grocery. Cable TV worked fine. Very nice place between the ocean and the river. You can hear and smell the surf, though you can't see it. You better love sand, though, because it is everywhere - sites, roads wind, and all. Went there today to visit and check it out before visit. Wife came in HOLDING our 9 lb yorkie. She was told no dogs allowed. Since I am from Florida and am familiar with Florida laws I asked why. I was told that they sold bagged potato chips and candy bars Florida does not allow dogs. That is not the intent of the law and they know it. They are NOT pet friendly and try to use the law instead of having the Xalls to just say WE don't like or allow dogs. The restrooms were nasty too. I LOVE MY PETS and rudeness I cannot stand. Other reviews have mentioned rudeness too... beware or find a friendly place. Stayed overnight on the way to Orlando, wish we could've stay the week. The sites were not exceptionally large but even while close together the bushes offered plenty of privacy. The layout was great with lots of site options. The restaurant out back on the river was awesome. Couldn't resit going for an ocean swim across the street, 5 minutes from the site. Clean, good layout and nice location. Did cover one of my pet peeves by charging for children. We stopped here overnight spending the day visiting St.Augustine. The campground was incredible! We had a great site (155) near the intercoastal. The park has many Live Oaks and spanish moss making it very shady and tropical. The sites are dirt or crushed shells with full hook-ups. They're kind of close together but you don't really feel it because of the trees and vegetation. Check-in was a breeze and they were very friendly and accommodating. They even let us check-in at 9am because the site was empty from the night before. The beach is right across the street with nice sand and huge waves. We will definitely be back to stay longer! Good job guys! This was one of the best parks I have stayed at. WiFi isn't great, you have to go to the office to use it, everything else is a 5, but the camp sights are a 10 on a scale of 1 to 5. The staff is friendly, the small store has the necessities. I loved the camp, the location and the facilities. It was great. This is also my first review if that is any indication of how I felt about this camp. We stayed at this campground twice while in St Augustine. We will not stay again. Let me start by saying this is not a bad campground but they should do much better considering the high cost of the sites. The sites are a good size and secluded but all loose sand. Satellite TV will not work due to vegetation. Picnic tables at sites were in very poor condition and moldy. There is a security gate which is good but for some reason it is extremely tight and very close for big rigs to squeeze through. WiFi does not work at the sites at all. They will tell you it's OK but then admit it does not work at most sites. There is a nice restaurant at the rear of the grounds and the view is nice. The staff is OK but not overly friendly.. Wooded campsites. All dirt. Entrance at gate is very tight. Watched a fellow camper tear up his camper on the gate. Wifi does not work at the sites. Nice restaurant at the rear of the grounds! Beautiful view of the river. Beach is across AIA. No crosswalk. Nice and secluded sites,Great views. The area has plenty to do,The staff is very friendly and accommodating.We just loved the area.Will be back next year. I have camped many places ( state parks as well as private facilities): This is far and away the most outstanding place I have ever stayed at!! Ideal location, exceptionally private sites!! Pleasant campgrounds overall, and generally clean campsites. The main area that was not satisfactory is that Wi Fi was only available by going to the office building area. This is inconvenient for those that are handicapped for taking long walk to office building. . Very nice place, trees on main road need to be trimmed, no room for two vehicles to drive down main road. Check in lady can have a attitude for a simple question, but if you give it back to her she stops. Very expensive place and wifi does not work unless your in the middle of the park and then it's hit or miss. However a very quite place and Aunt Kate's and Caps are within walking distance. What a nice park! Our back-in site was close to the office. Like most of the park, each site was very private, shielded by shrubs or trees. The beach is right across the road. The Reef and on-site Katie's Kitchen restaurants had good food at reasonable prices. The park had a couple of piers for those who like to fish, and narrow beaches. Nice office and store, and the staff were very friendly. Good laundromat by the office. The pool and outdoor courts were very nice. It was convenient to have the on/off trolley shuttle come right to the park to take us to St. Augustine, a beautiful city with lots to see and do. Price was reasonable. My husband and I really enjoyed staying at North Beach Park Resort! The campground was beautiful, clean, quiet and close to the water. We had a slightly small campsite BUT we have a large fifth wheel (42ft. with 5 slides) We changed our spot the day before arrival because we wanted to be closer to the water therefore the tighter spot was perfectly fine with us. We will be back again in the future! Florida coastal rustic - many private sites. Family / pet friendly. Clean. Terrific ambiance!! Sunsets are spectacular - Lovely camp restaurant on site. Not pet friendly ! Would not allow my English Bulldog to stay. One of the easy going breeds on earth ! This was our first stay at North Beach Camp Resort, but it won't be our last. The resort is very picturesque, clean, and maintained. Aunt Kate's is a very good restaurant. Restrooms are very clean. We will be back. 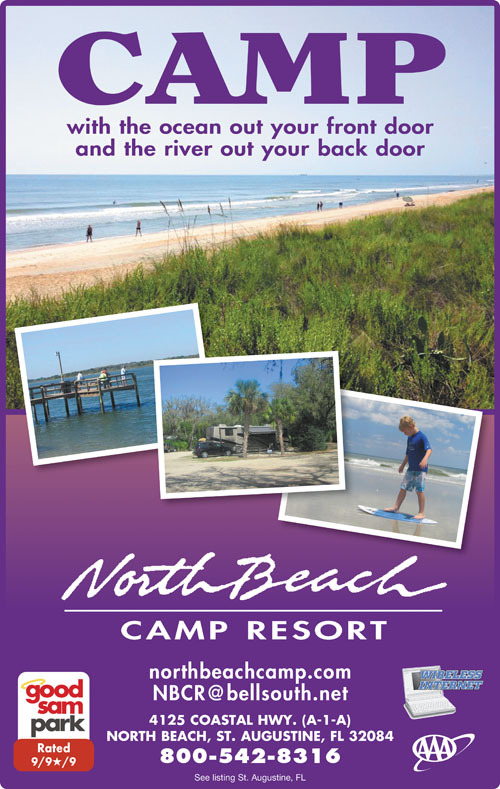 I recommend the North Beach Camp Resort to any camper. It's a family type atmosphere. We really enjoyed this campsite. The front of the site is across from the Atlantic Ocean beach and the rear is along a river. We have two dogs who loved the hidden walkways along the river and long walks on the ocean beach. We have a 42ft fifth wheel and had no problem with a pullthrough. There were other backin sites which looked real nice and private. We use DirecTV satellite and some had so much privacy that a satellite view was not possible. St Augustine is a short drive. This was our first trip to St.Augustine and enjoyed every minute. The folks at the campground were extremely helpful. The facility was very clean and quiet.We certainly will return to this campground in the future. Don't miss Aunt Kates for a great place to eat. We have been here several times and keep coming back. Location is amazing, inter coastal at the rear of the campground (with fishing dock with fish cleaning facility and kayak launch area), bait shop boat ramp and Aunt Kate's restaurant adjacent to dock. Across A1A is campground parking for the beach and the Reef gourmet seafood restaurant. Pull through sites are huge and many are shaded . Plenty of space between sites. The only down side is it's ALL sand so be prepared to sweep out the camper frequntly. Old St Augustine is only 3 miles away.